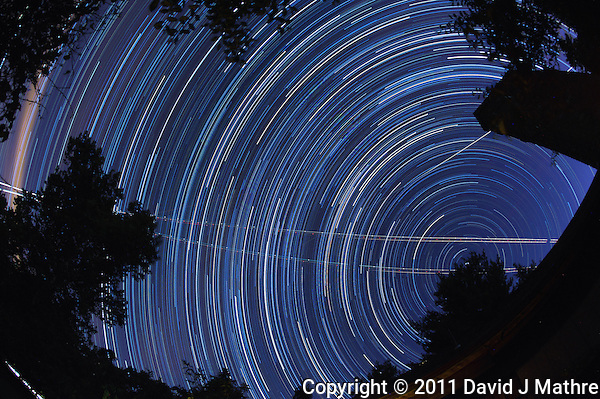 Late August Star Trails. Since it looked like the sky was going to be clear last night, I left a camera out on the deck to get some star trail images. The first one was before midnight, and the second one after midnight. I did this set with a fisheye lens to get as much of the sky as possible. There is a tree in the front of the house that is blocking the northern star. 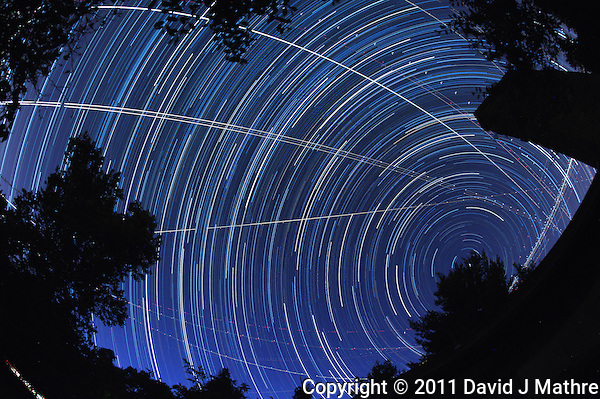 I also used the images to create a time-lapsed video of the night sky. Too cool! I’ve been wanting to try this kind of thing; we live right by the airport, so there’d be TONS of plane trails. I worry about the light pollution, though. There’s too much light nearby. I just need to try it! Light pollution is an issue, but then again I am doing this on the east coast in New Jersey. Dave — tell me about the program that you use, please. I’ll do a post that describes the whole process.